I have been reading a lot about iOS7 UI transition. I am not able to get what these three properties automaticallyAdjustsScrollViewInsets, extendedLayoutIncludesOpaqueBars, edgesForExtendedLayout?? For example I am trying to make my view controllers start below the status bar but I am not able to achieve it. Basically, with this property you set which sides of your view can be extended to cover the whole screen. Imagine that you push a UIViewController into a UINavigationController. When the view of that view controller is laid out, it will start where the navigation bar ends, but this property will set which sides of the view (top, left, bottom, right) can be extended to fill the whole screen. Here you are not setting the value of edgesForExtendedLayout, therefore the default value is taken (UIRectEdgeAll), so the view extends its layout to fill the whole screen. As you can see, the red background extends behind the navigation bar and the status bar. This property is used when your view is a UIScrollView or similar, like a UITableView. You want your table to start where the navigation bar ends, because you wont see the whole content if not, but at the same time you want your table to cover the whole screen when scrolling. In that case, setting edgesForExtendedLayout to None won't work because your table will start scrolling where the navigation bar ends and it wont go behind it. 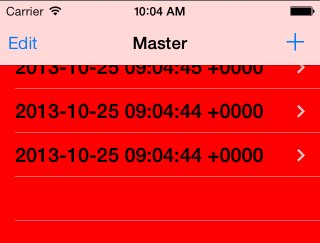 Here is where this property comes in handy, if you let the view controller automatically adjust the insets (setting this property to YES, also the default value) it will add insets to the top of the table, so the table will start where the navigation bar ends, but the scroll will cover the whole screen. In both cases, the table scrolls behind the navigation bar, but in the second case (YES), it will start from below the navigation bar. This value is just an addition to the previous ones. By default, this parameter is set to NO. If the status bar is opaque, the views won't be extended to include the status bar, even if you extend your view to cover it (edgesForExtendedLayout to UIRectEdgeAll). If you set the value to YES, this will allow the view to go underneath the status bar again. If something is not clear, write a comment and I'll answer it. 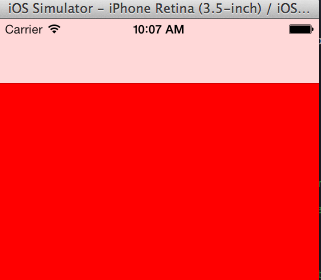 How does iOS know what UIScrollView to use? iOS grabs the first subview in your ViewController's view, the one at index 0, and if it's a subclass of UIScrollView then applies the explained properties to it. 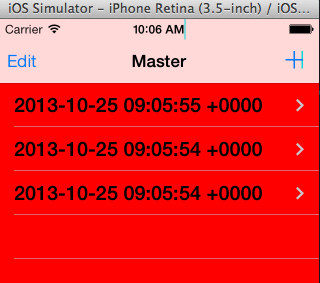 Of course, this means that UITableViewController works by default (since the UITableView is the first view). Select the view controller in IB, In the attributes inspector, deselect 'Extend Edges - Under Top Bars' and 'Extend Edges - Under Bottom Bars'. I am using storyboards and using the above advice worked however I wasn't exactly sure how to implement it. Below is a short example in swift of how it cleared up the problem by putting the recommended solution into the ViewController. // has a scrolling sub view. // Prepares the view prior to loading. Putting it in viewDidAppear didn't work. // so using self works as you might expect. // and not how it thinks it should place it. Resolved: Code above applied, turning off the auto-adjust. Other suggested, that it doest work even if it is the first subview, but there are other scroll views in the view hierarchy. If you want similar behaviour even if you can't fulfil these conditions (e.g. you have a background image below the scroll view), you can adjust the scroll view insets manually. But please don't set it to constant like 44 or 64 or even 20 like many suggest around SO. You can't know the size ever. There can be the incall/gps/audio notification, navigation bar doesn't have to be always 44 pts etc. You can use the bottomLayoutGuide in the same way. Not the answer you're looking for? Browse other questions tagged ios objective-c xcode uiviewcontroller ios7 or ask your own question. How to get the blurred and translucent effect on a navigation bar in iOS 7?